More than 1.2 million people in the U.S. are living with HIV, but one in six does not know they are positive. The Centers for Disease Control and Prevention (CDCP) recommends all people between the ages of 13-64 get tested for HIV as part of routine health care. Early diagnosis and treatment improves health, extends life and helps prevent the spread of HIV. 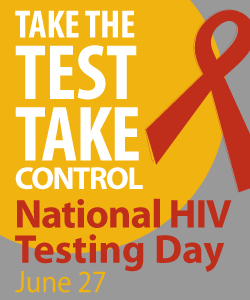 Greater Than AIDS is proud to support our partners across the nation in your outreach and testing efforts around National HIV Testing Day. Greater Than AIDS makes available free informational and promotional HIV/AIDS materials for download under the theme of ‘I Got Tested,’ produced especially for this day.